The client had an existing fabricated pallet gate. Which, although seemed solidly built, it was very heavy to use and when opened the edge gate protruded over the edge. It was constantly being damaged by contact with the fork lift mast. The stillage loads were very wide and high. 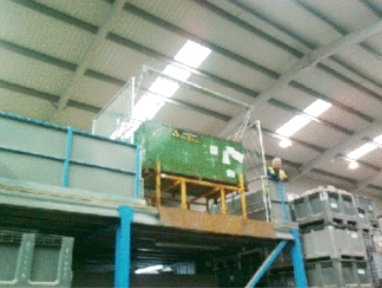 Supply of Delta space saving, low headroom high load pallet gate. This design does not protrude beyond the mezzanine edge when open. Inside dimension 2880 mm wide x 2800 mm load height clearance x 2000 mm depth. The all galvanised gate assembly included full depth and height weld mesh side screens to protect operatives and prevent debris falling through the opening. With only 280 mm difference between inside height and overall height, it ensures optimum headroom is maintained. Gate fitted with gravity lock ensuring it cannot inadvertently open when not in use.